Here’s my first art journal page for “Me: The Abridged Version” class I am taking at Big Picture. I really wasn’t going for anything, I was just playing. I started out by using my old stick pastels from my days in art school. They were so dusty and messy they made me really happy I splurged on the Pan Pastels (I can’t wait to get them!). Then I just played around with some patterned papers from my stash, some bits and pieces from my collage box (stamps, flower cut-outs, etc. ), and ink, layered it with lots of gel medium, and then stuck on the letter “a”. I’ll journal about my list of “A” words on the little notebook paper. It’s not exactly what I imagined when I started out, but it was lots of fun and I’m excited to keep going with this. I started the page for “B” last night, and hope I’ll have some time to play in my art journal and work on it some more later today. Beautiful page! I just got some pan pastels and I’m loving them! Hope you like yours when they arrive! Wow, lovely collage! 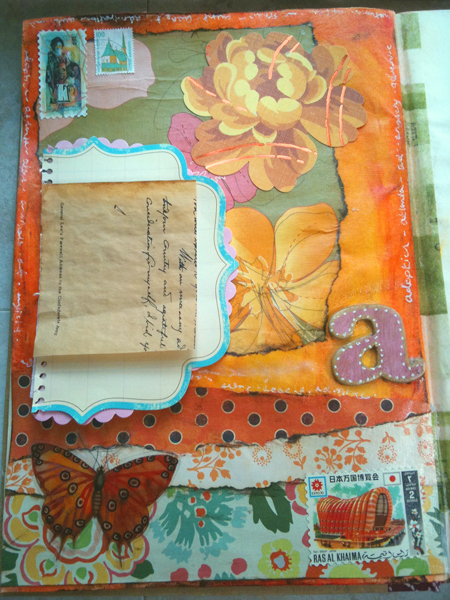 I think it’s so cool you are doing an art journal version…so much more playful! Love your page! You inspire me; I’ve been toying with the art journal idea but having a hard time diving in. Thanks for posting about your process, and about the pan pastels, I’d never heard of them.